There is a total of 6 newly renovated non-smoking rooms on the 2nd Floor. Room-Sizes range from 12 to 23 square meters, bed sizes: 180 cm width (in the smaller room 140 cm width one big Bed). A room on the road, the other two very quiet with a view of the large, green garden. 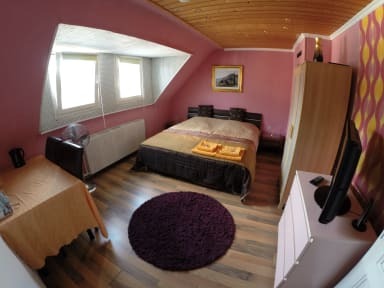 The equipment in each room includes a television (FLAT-LCD-TV), satellite receiver or DVB-T, wireless DSL, dryer, private marble bathroom with a toilet, basin and shower (the smaller rooms has only toilet and basin), soap, toothbrush, free tea in the room, water heater, paper towels, shower and soft towels, bed linen, a bottle of water, lockable safe rooms, information kit in each room and alarm. In Brueck, you can relax in the nearby forest area Koenigsforst (10-minute walk), in beautiful beer gardens and restaurants of all kinds and price categories. Not far away you find the spa temple Mediterana for your wellness (4 stations, 10 minutes) in Bergisch Gladbach. On the eastern edge of the Cologne city area located on the outskirts of the popular business Koenigsforst, Brueck is a quite district of Cologne with a population of about 10,000 within green surroundings, just a few minutes away from the cosmopolitan city. Brueck since 1914 is a suburb of Cologne and has been a favorite place of residence. Starting at the 16th century Brueck evolved into a prosperous place. The artery is the Olpener street, in which several retail centers established. There you will have your room! In about 3 minutes walk to the tram stop line 1 Flehbach road. As a result, there is a direct connection with the metro to the fair and Cologne Deutz in about 10 minutes, and a direct connection to the inner city, with the cathedral, Old Town and shopping and the cinema and culture scene (about 12 minutes). The Cologne-Bonn airport is 12 minutes by car or taxi. The Rose Monday parade in Cologne is just 12 minutes far away, if you take the metro to the city.